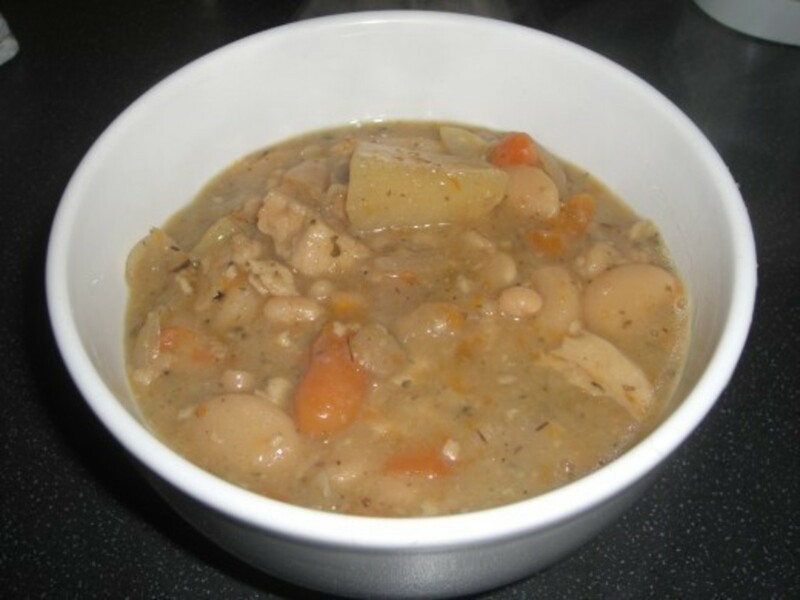 Traditional Guernsey Bean Jar is a delicious, inexpensive stew-type recipe usually made with beef shin and/or pork hocks, or pigs trotters and haricot/butter beans. It originates in the British Channel Island of Guernsey (just off the coast of France) and dates back as far as anyone can remember. Legend has it that local bakers would allow the poorer islanders to use their ovens to cook the bean jar in overnight. In the morning the islanders would come to the bakers to collect their earthenware pots of hot steaming bean jar and take it home to feed their families (usually served with hunks of bread and Guernsey butter). 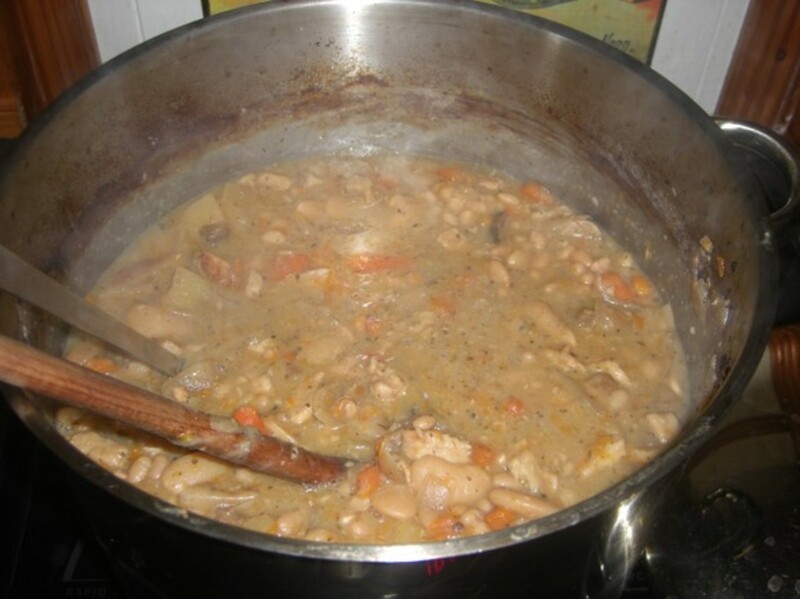 The tradition of making Guernsey Bean Jar carries on to this day, although with the arrival of such inventions as electric or gas ovens and slow cookers, it has become far less troublesome to cook than it was in the days when only a crock pot and a baker's oven were a practical and affordable way to prepare this simple, tasty and inexpensive meal. 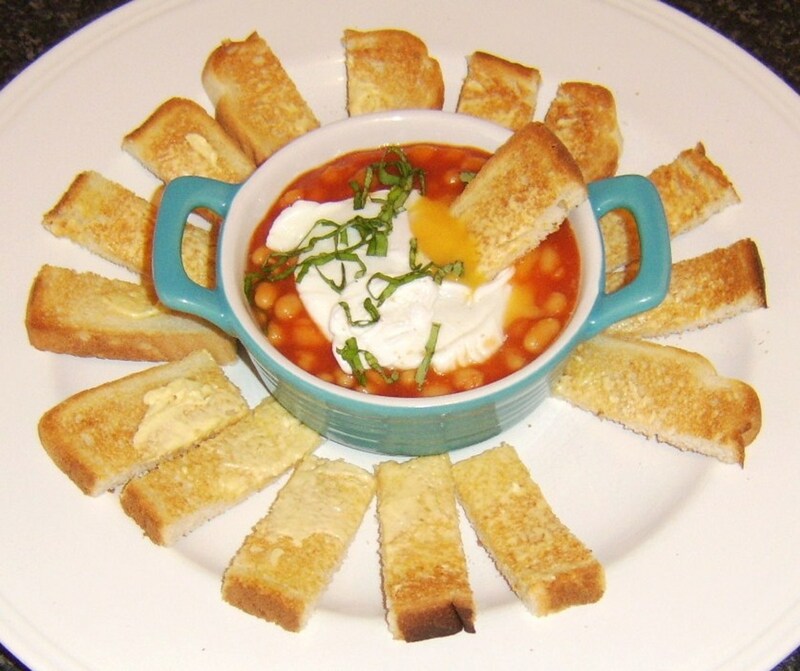 Of course there are many vegetarians who are unable to partake of the delights of the meaty wholesome traditional bean jar, and it is with this in mind that I have come up with a vegetarian alternative to the standard Guernsey Bean Jar recipe. 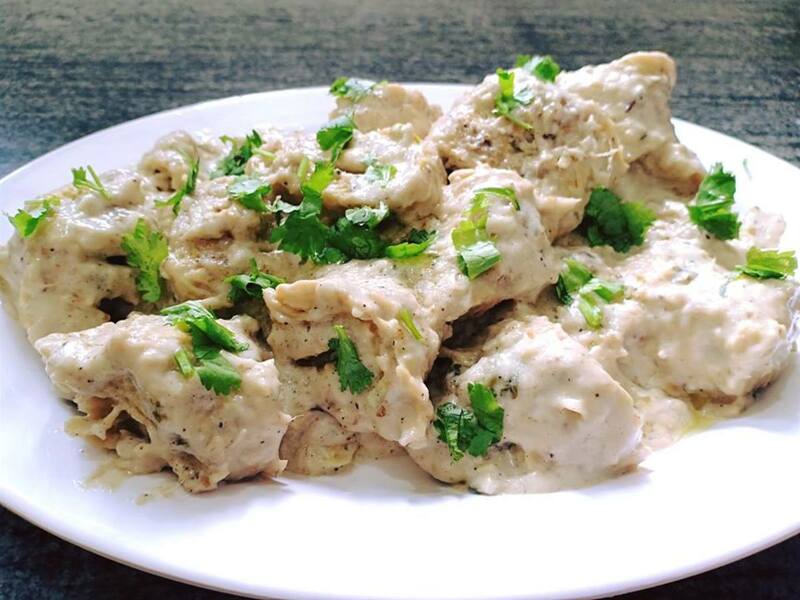 I am assured that this is an excellent version of the original recipe, and have been told this by people who enjoy both vegetarian and meat based meals. I hope you too enjoy this winter warmer once you give it a try for yourselves. 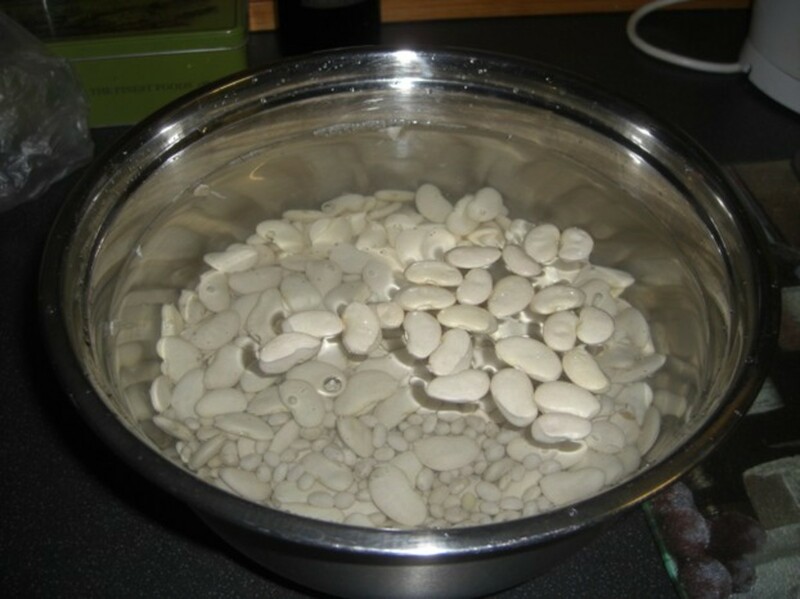 Place your dried beans in the large bowl and fill the bowl completely with cold water. 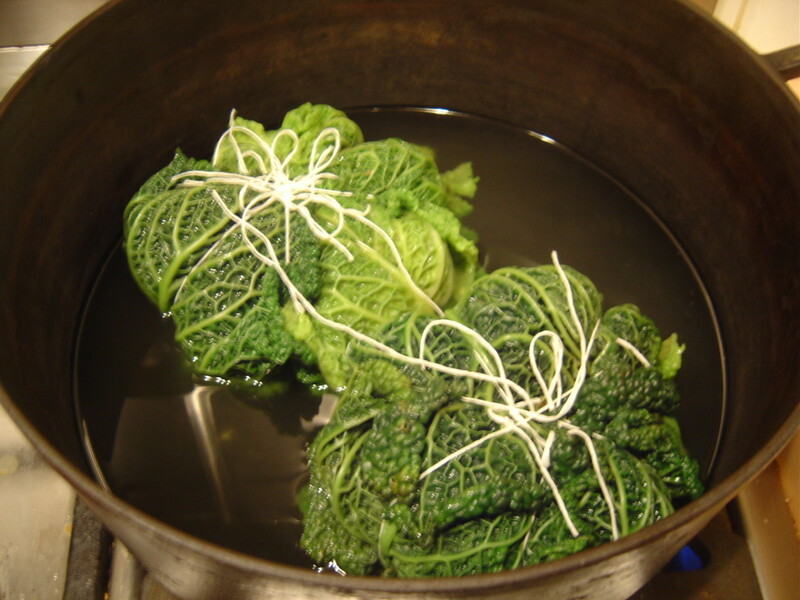 Leave to soak overnight. 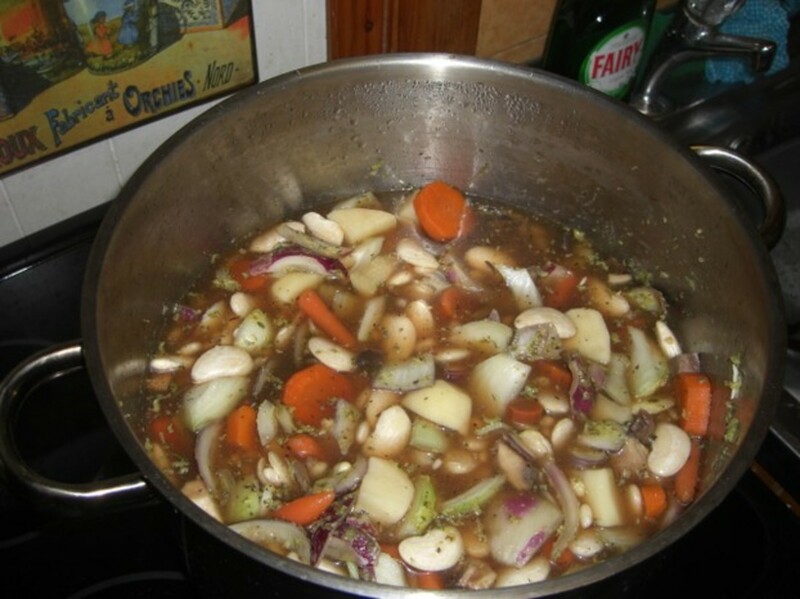 The following day peel and and roughly chop your carrots, onions and mushrooms. Peel your potatoes, chop into chunks and rinse in cold water to remove all starchiness. 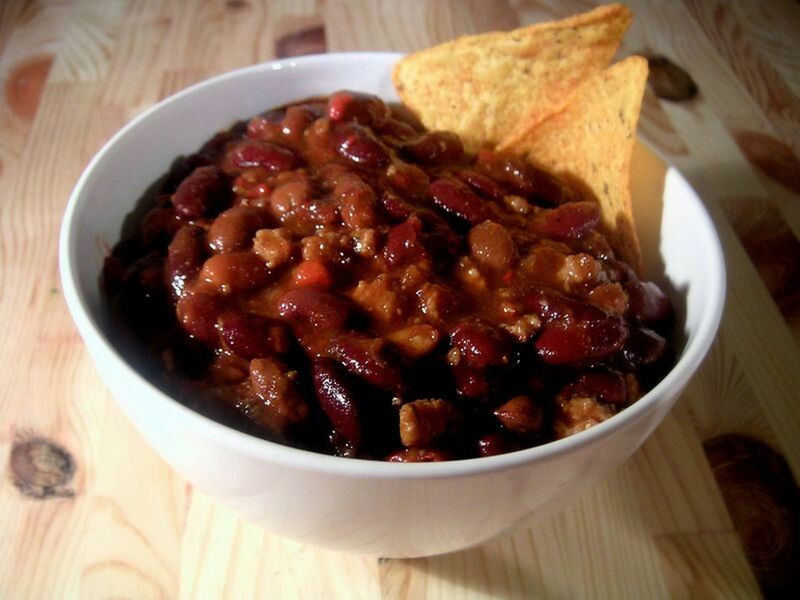 Place your vegetables and your soaked beans into the large casserole dish or slow cooker. Add your vegetable stock, butter, mixed herbs and the pepper, (leave adding the salt until the bean jar has finished cooking in order to avoid the beans staying too hard). Keep the uncooked Quorn pieces for later. Bring your prepared vegetables and beans to the boil as quickly as possible, either on a high oven or the 'high' setting on your slow cooker, before then reducing the heat to approx 100 degrees Celsius or 'low' on your slow cooker. Cook for approx 6 hours. 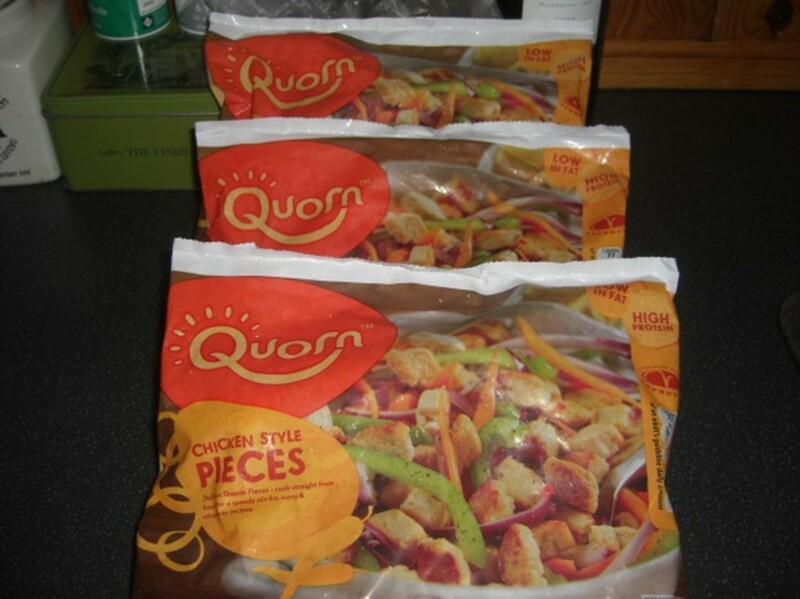 Cook the Quorn pieces as per the pack instructions, and then add them to the casserole dish or slow cooker. Cook for a further 2-3 hours. Note: If the bean jar is too watery either remove the lid for a while to allow some of the liquid to evaporate away or alternatively add a couple of tablespoons of cornflour mixed with cold milk to the dish and stir in. Return to the oven until the bean jar is boiling again and has thickened up. Adding further pre-cooked potatoes will also help to thicken the bean jar. Season with salt according to taste, (and adjust other seasoning as required). 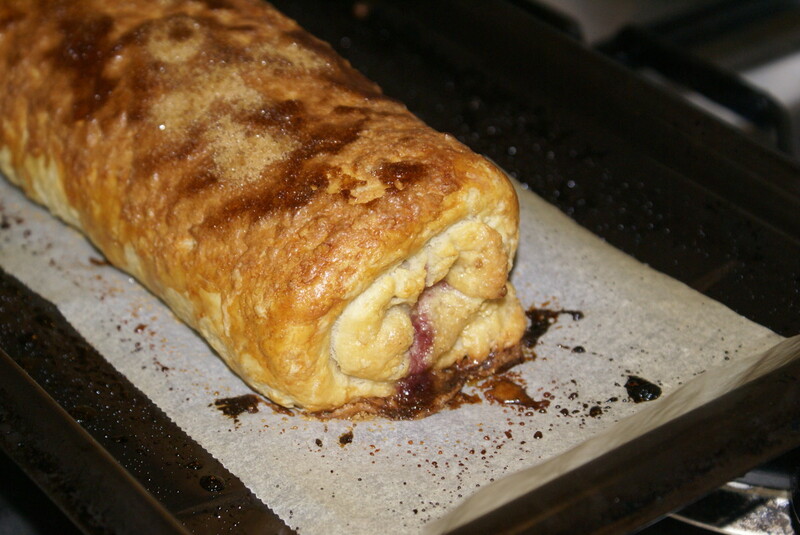 Serve with buttered crusty French bread. For even more tasty results allow to completely cool and reheat the second day when the flavours will have developed even more depth. I love beans! 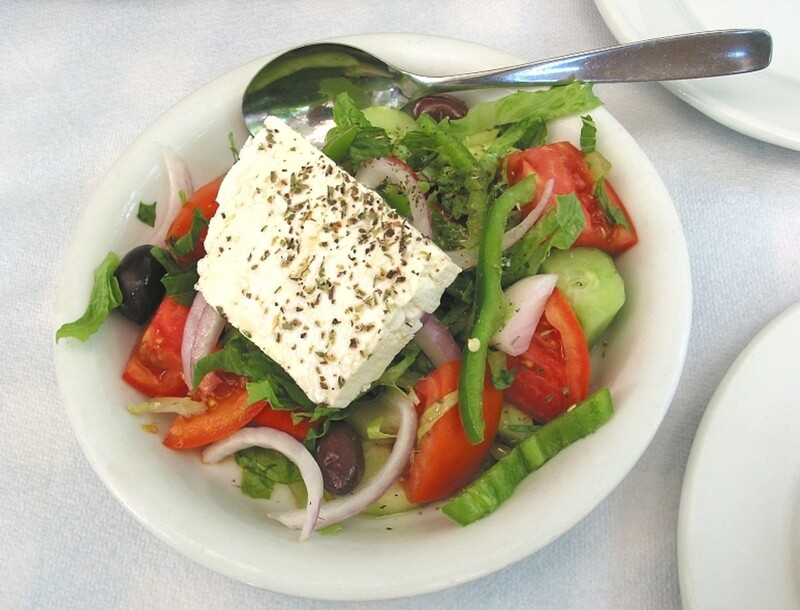 This looks delicious and I will try it when the cooler weather hits-- today it is around 30C so we are sticking to salads and sandwiches. Hope you try it Kristen, and I am sure any similar vegetarian meat 'copy' could work equally well. Haricot beans are basically the same beans they use in cans of baked beans. Delicious recipe. I never heard of Quorn meat or haricot beans. I would love to give it a try. Thanks gardener den, hope you enjoy it. Sounds like a great recipe! Have to try this one! Thanks keep up the great work and writing. Gardener Den. You are very welcome divactratus. 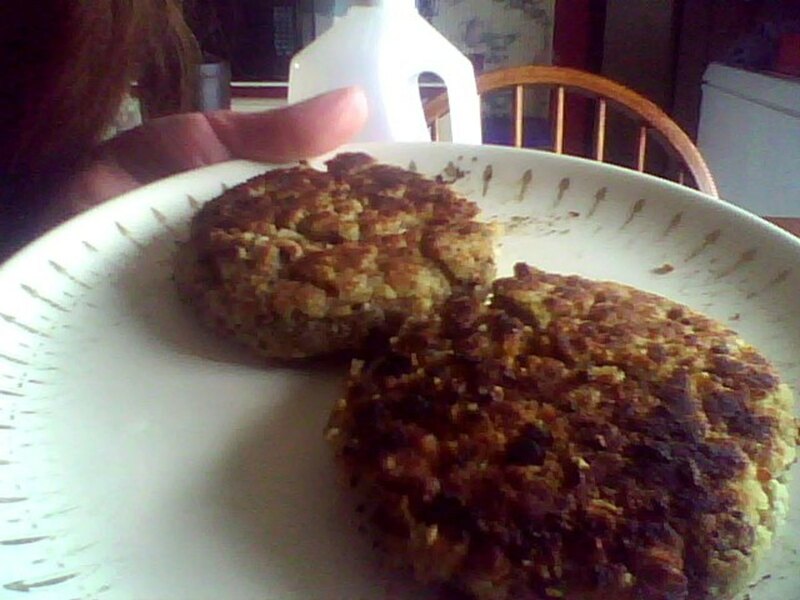 Looks yum! Thanks for sharing the recipe.